Thou shalt not pass... without checking out this Thor Premier Collection Statue! The second full-size resin statue in the Marvel Premier Collection is none other than Thor, God of Thunder! Based on a famous 1969 cover image, Thor wears his timeless classic outfit and swings his hammer as if preparing to hurl it skyward. 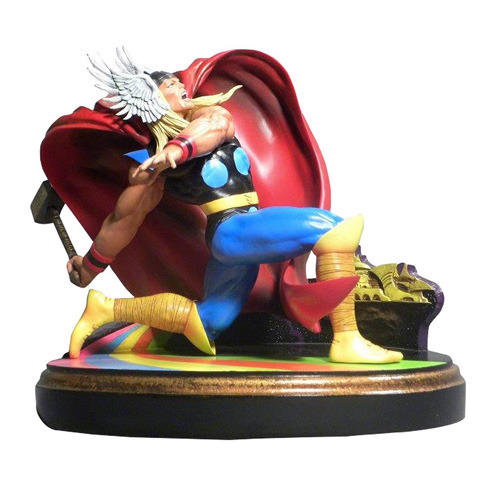 Crouching on a circular base designed to represent Bifrost, the rainbow bridge of Asgard, this 7 1/2-inch statue of Thor is limited to only 3,000 pieces, and comes packaged with a certificate of authenticity in a full-color box. Sculpted by Clayburn Moore. Ages 13 and up.